If I were to describe Marilynne Robinson’s storytelling in one word, that word would be compassionate. Whether she’s writing about a old minister contemplating death, a middle-aged woman contemplating life, a prodigal child, a judgmental parent, old ladies concerned with their own comfort, or a vagabond drifter, she manages to draw out the qualities that make these people worthy of our concern. Their alarm was evident from the first, in the nervous flutter with which they searched their bags and pockets for the little present they had brought (it was a large box of cough drops—a confection they considered both tasty and salubrious). Lily and Nona both had light blue hair and black coats with shiny black beads in intricate patterns on the lapels. Their thick bodies pitched forward from the hips, and their arms and ankles were plump. They were, though maiden ladies, of a buxomly maternal appearance that contrasted oddly with their brusque, unpracticed pats and kisses. Lily and Nona are minor characters, but even in this single paragraph, we learn a lot about them. They’re not at all prepared to deal with children, for one thing. They like things to be nice, given the patterns and beads on their coats. And even though their short stint as parental figures is doomed, they mean well, as evidenced by the cough drops. When they soon leave Ruth and Lillian in the hands of the girls’ aunt Sylvie—possibly an even less capable parent—I couldn’t be angry with them because I recalled that nervous flutter and those unpracticed pats. They were out of their depth, and Sylvie was their one way out. Ruth, the narrator of Housekeeping, looks back on all the people around her with kindness, but also with a sense of detachment. This is very much a book about detached people. 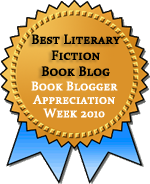 Even the little town of Fingerbone, where the novel is set, is detached from the rest of the world. The only sign of the outside world is the train that comes through town and the drifters that sometimes appear on it. But Ruth—and Fingerbone—cannot evade history. The lake is filled with bodies of dead ancestors. Ruth’s grandfather is down there, along with all the passengers on the train that plunged off the bridge and fell to unreachable depths. Ruth’s mother is there, too. These lost people loom larger for Ruth—and perhaps Sylvie—than any of their neighbors do. Somehow in dying, they’ve become more alive. Say that the water and I bore the rowboat down to the bottom, and I, miraculously, monstrously, drank water into all my pores until the last black cranny of my brain was a trickle, a spillet. And given that it is in the nature of water to fill and force to repletion and bursting, my skull would bulge preposterously and my back would hunch against the sky and my vastness would press my cheek hard and immovably against my knee. Then, presumably, would come parturition in some form, though my first birth hardly deserved that name, and why should I hope for more from the second? The only true birth would be a final one, which would free us from watery darkness and the thought of watery darkness, but could such a birth be imagined? Note all the contrasts here: miraculously and monstrously, repletion and bursting, a bulging skull and a body folded in upon itself, death and birth. The whole book is filled with contrasts. Ruth and Lillian are also contrasts, with Ruth thinking of the dead and Lillian concerned with fitting in among the living. The great aunts who want never to leave their home in Spokane, the younger aunt who never makes herself at home anywhere. The driving question of the novel, if there is one, is which contrasting path Ruth herself will choose, and Robinson’s storytelling is such that the most sensible path is not necessarily the one that makes the most sense for her characters. Housekeeping is a short book, but it’s not a quick read. Robinson’s language is extraordinary, and I found it even more striking here than I did in Home and Gilead. (I think the other two were so close to the bone when it came to their themes that I could hardly think about the language.) The story is not one that will keep you on tenterhooks, although I was interested in the characters. The prose actually is the great draw. Slow reading is worth it. Give yourself time. Absorb it. 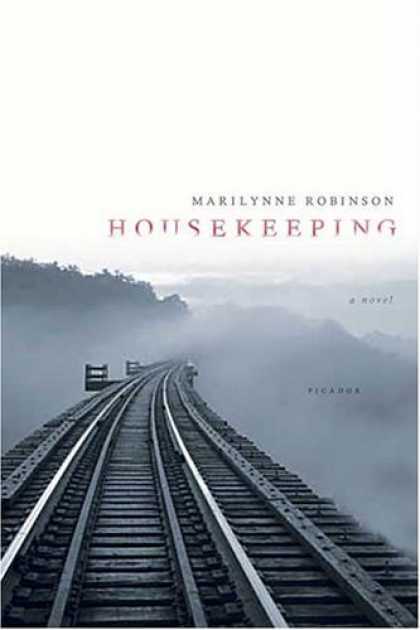 After my own languid reading of Housekeeping, with a heavy sigh, I turned the last page and began hoping that Marilynne Robinson is at work on her next novel so that my wait will not be as long as that of Housekeeping‘s first readers, who had to wait 24 years for her to write Gilead. I take heart in the fact that there was only a four-year gap between Gilead and Home, but I suspect that the short gap is attributable to the fact that those two novels were in the same world and involved the same characters. And so I expect a long wait, but hope for a short one, or at least as short a wait as it will take for Robinson to produce such fine writing and such remarkable characters. I’d rather have a few works of great beauty from her than a stack of mediocrities. I was also struck by the difference in the language between Housekeeping and Gilead. Don’t know if it’s a change in style given the time lapse or a deliberate choice of the language tone that best fit each story. I wondered if there was much of a change or if it was just that I didn’t notice the language in Gilead, but I see I’m not alone in that observation. My guess is that the difference comes from a combination of time and the difference in story. So some of both. Wonderful post, Teresa. Having read and loved all three novels, I would say it is the depth of language and images from Housekeeping that have stayed with me. A lot of the scenes are sticking with me and I imagine they will continue to do so. The train, the walk across the bridge, the flood. I almost put this one on our book swap list, but decided not to because I knew you would read it anyway, and love it as much as I did. I found it dreamy — underwater, so to speak — and sharp at the same time. So beautiful and strange. Yes, there’s something extremely dreamlike about it, much more so than her other books, which feel so grounded in reality. You capture the book beautifully. I reread this a couple of years back and it was only after doing so that I realised that she had produced two more novels. I guess I had read too often that she had only one novel. I have since read Home and blogged on it here: http://theknockingshop.blogspot.com/2011/04/home.html but am not hurrying to read Gilead as it’s good to have it to look forward to. I had never even heard of Robinson until Gilead was published. And I know what you mean about being glad to have another of her books to look forward to. I’m a little sad now that I’ve read them all and must wait for more. I had this one on my shelves for four years or so (before I even read Home!) They’re all worth reading. I tried to read this one, but just couldn’t get into it. And now I’m scared to even try Gilead. I think Home is probably her most accessible book, so I’d go for that before Gilead if I were you. (And I found the language here more complex than either of her later books.) But that said, I know a lot of people who can’t get into her prose at all. A great review, also for one who have not yet got around to read any of Marilynne Robinson’s books. Is there any other writer you would compare her with, writing in the same tone or style? Oh, that’s a tough question. I can’t think of anyone who writes in quite the way she does. I’ve heard some say Emerson and Melville, but I haven’t read them. I kind of want to say Willa Cather for the settings and the contemplative style (but I’ve only read one Cather). Wonderful review. LIke Sigrun I have not read Robinson’s books and look forward to reading Housekeeping. I want to reread Housekeeping and read Home for the first time. Gilead has stood up to rereading for me, and I’m sure Housekeeping (and Home) will too. I have to be in the right reading mood to enjoy a slow book with beautiful prose. This is one that is appealing to me on many levels. I already have Gilead on my shelves but haven’t read it yet. I’ll add this one to my list. Yes, this is definitely one to read when you’re looking for prose over plot. Otherwise, it could feel like a slog. But if you’re in the right mood, it’s beautiful. I read Housekeeping when it first came out–and still use a few phrases from it (“like a Carthage sewn with salt,” for example). Really beautiful book and one that resonated with me so deeply. I read it every few years. Her two newer ones just appeared on my shelf a few weeks ago and I am looking for a calm and quiet time to read them. I didn’t know there was a film. I’m having a hard time imagining it. If it ever becomes available on DVD, I may give it a try, since both you and Roger Ebert liked it.